The hair-raising scenes of the Dice Hall of Hastinapura are past now. Yudhishthira has for a second time lost his kingdom and all that was his. As per the conditions agreed to before the game started, the losers had to live twelve years in jungle and one year in hiding, during which year if they are discovered, they have to repeat the cycle of thirteen years again. Accordingly the Pandavas have surrendered their kingdom to Duryodhana and are now living in the Kamyaka forest. While all this was happening, Krishna was away from Dwaraka, fighting a war with Salva at Saubha and had no knowledge of the dice game or of the subsequent events. When Krishna reaches back Dwaraka after the war, Satyaki informs him of the sad, terrible events at Hastinapura and Krishna leaves everything and rushes to Kamyaka to meet the Pandavas and share their sorrow. He knows they need him with them at this moment of loss and only his presence can give them the strength they need now more than ever before. Many Bhoja, Andhaka and Vrishni chiefs join him. Draupadi's brother Dhrishtadyumna, Chedi King Dhrishtaketu, the prince of Kekaya and many others too reach Kamyaka to be with the Pandavas in their hour of need. Draupadi breaks down in front of Krishna and speaks of how she was dragged into the assembly and humiliated there during the dice game. How could anyone drag a woman like her into a royal assembly, she asks Krishna. A woman who is the wife of the sons of Kunti, Dhrishtadyumna's sister and his, Krishna's, friend? And that too when she was in her monthly period and dressed in a single piece of cloth stained by her menstrual blood? She tells Krishna of how the sons of Dhritarashtra wanted to 'enjoy' her like a common slave woman. And that while the Panchalas were alive, while the sons of Pandu were alive and while the Vrishnis were alive? Shame upon the strength of Bheema, she tells Krishna, shame upon Arjuna's Gandiva, that the two of them stood watching their wife being thus humiliated before their very eyes. he has the power to protect her. Krishna speaks with the voice of destiny itself. And those words instill strength and confidence in Draupadi's [as well as in the Pandavas'] mind. And in doing so he gives us a lesson in true leadership: a leader instills confidence. Later Krishna would risk his own life to avoid the war by going to Hastinapura on a peace mission. But at the moment he knows it is not talk of peace that would help a shattered Draupadi gather herself together but of vengeance and that is precisely what Krishna does. Krishna shows this uncanny ability to restore confidence in people through his words and actions again and again throughout the Mahabharata. The Pandavas live twelve years in the jungle and one year in hiding in Virata to fulfill the terms of the dice game they had lost. When they claim their kingdom back at the end of it, Duryodhana refuses to give it back to them and instead asks them to go on another round of twelve years of life in the jungle and one year in hiding, as the conditions of the dice stipulated, saying that they had been discovered just before they completed their year of life in hiding. War becomes inevitable but Krishna decides to make yet another attempt at establishing peace. He gets ready to go to Hastinapura with a message from Yudhishthira. The message is: peace at any cost. The Pandavas would settle for as little as five villages. Give these to them, and there would be no war. Draupadi hears of Krishna's peace mission and comes before her sakha ' her friend, Krishna. Her dark, curly hair is loose, as it has remained for thirteen years now. She had been dragged by her hair to the assembly by Dusshasana and she would tie it up only when it has been besmeared with the dying blood of Dusshasana. She tells Krishna of what wise men say: that not to kill someone who deserves death is as much a sin as killing someone who does not. And she does not want Krishna to be tainted by that sin. The fire-born Draupadi's words are always fire. She tells him she is speaking words she has spoken earlier, asking questions she has asked him earlier. Is there another woman on earth as unfortunate as she is? Daughter of a king like Drupada; born from the heart of a burning sacrificial pit; Dhrishtadyumna's sister; and his, Krishna's, friend. She became the daughter-in-law of the illustrious Pandu and thus a part of the celebrated royal family of Ajameedha. She married the five Indra-like sons of Pandu and became the mother of their five sons. And yet she was caught by her hair and dragged into the royal assembly. While the sons of Pandu watched. And while he, Krishna, was alive. While the Panchalas and Vrishnis were still living. Finding no help coming from her husbands, she had called out to him, to her Govinda, begging for protection again and again. Draupadi then takes her thick, curly, long, dark, snakelike hair in her hands and holding it up before Krishna, tells him: 'Remember this hair of mine, Krishna, every time you speak of peace with the sons of Duryodhana. Keep this in mind, and also remember that if Bheema and Arjuna will not fight for my honour, then my old father will do it for me, along with his sons and my own sons, lead by Abhimanyu. My heart shall know no peace Krishna, until I see the wicked Dusshasana's dark hand that touched my hair severed from his body and lying in the battlefield covered with dust. I have been tending a fire in my heart, Krishna, for thirteen years.' With this the beautiful Draupadi breaks down in inconsolable tears before her only friend in the world. Once again Krishna shows how well he knows how to give strength to and restore the confidence of those who have neither. Eighteen akshauhinis is a huge army: 393,660 elephants, 393,660 chariots, 1,109,700 cavalry and 1,968,300 foot soldiers. And this army is standing face to face in the battlefield of Kurukshetra. The greatest battle ever fought on the soil of India. Every king, small and big, from all across the land is present there, each with his army. Conches have already been blown, announcing the beginning of the battle. The armies would clash any moment now. 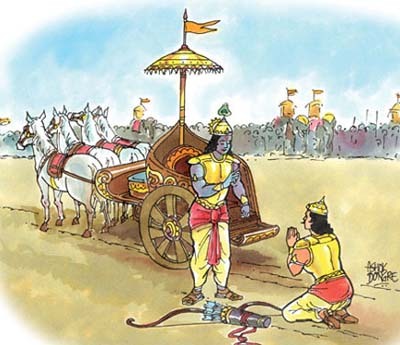 Arjuna asks Krishna, his driver, to take his chariot right to the centre of the battlefield. 'Take my chariot to the middle of the two armies, Krishna, for I want to have a good look at the warriors hungry for battle assembled here to please the evil Duryodhana.' Krishna does what he is asked to do by the one man whom he loves more than anyone else in the world ' his friend, his cousin, his brother-in-law and the greatest warrior on earth. Arjuna takes a look around and what he sees is not two armies of fierce warriors but his dear revered grandsire Bheeshma, his guru Drona, guru's son Ashwatthama and countless others near and dear to him. There are fathers and sons standing there, uncles and nephews, brothers and cousins all ready to maim and slay each other in a brutal war. His eyes cloud, head reels, perspiration covers his body, legs give way under him, arms lose their strength, the mighty Gandiva falls from his hands and he collapses on the chariot floor, telling Krishna 'I shall not fight' and giving a hundred reasons why he will not. It is better to live begging for alms than enjoying pleasures stained by the blood of such near and dear ones, he tells Krishna. Krishna gives him the teachings that the world today knows as the Bhagavad-Gita Gita, the immortal spiritual classic generally acknowledged as the most beautiful spiritual gem in the world. Arjuna wanted to desert his horrid duty and escape into a life of renunciation and Krishna teaches him what true renunciation means and how it is not running away from the battlefield of life but standing there facing it. When Krishna finishes, Arjuna picks up the Gandiva from the chariot floor, straight, energy and power coursing through his veins, confidence resonating in his voice. He is now ready to wage the war for which he has been preparing all his life. The Bharata kingdom has been divided and Pandavas have been given Khandavaprastha, the wilderness around modern day Delhi. They clear the land and establish Indraprastha there, a splendid capital city by any standards. Yudhishthira turns out to be a just, loving and competent ruler and the glory of the Pandavas spread wide. For the glory of his dead father, Yudhishthira now wants to conduct a rajasooya sacrifice which will declare him as the most powerful ruler on the earth. He consults sages and brahmanas, his ministers and his brothers, all of whom advise him to go ahead and do that, but he is still not sure. How does he know that everyone is advising him to go ahead just to please him and not because they feel he should do it, he asks himself. Or maybe they all have something to gain from it and it is for their selfish reasons that are asking him to do the sacrifice. But there is one person who would give him advice he can trust totally ' Krishna. Yudhishthira sends word to Krishna telling him he wishes to consult him and Krishna comes to Indraprastha. Yudhishthira places his concerns before him. He certainly wants to do the rajasooya, but he is not sure he should do it, nor even that he can do it. Krishna, as always, looks at things from the higher standpoint. For him it is not a matter of Yudhishthira's or the dead Pandu's glory, nor even the glory of the Bharatas as a whole, but a matter of the welfare of the world, the one goal for which he has lived every day of his life ' lokasangraha. Krishna paints a very detailed picture of the dark political situation of the land at that time. One by one he takes the names of the kings of the land and tells how Jarasandha has conquered or subjugated each. The list includes many who are very close to Yudhishthira and who cherish love for him in their hearts, but such is the evil might of Jarasandha not one of them is able to take an independent stand against him, barring a rare king here and there. The dungeons of Jarasandha at Girivraja contains eighty-six kings he intends to sacrifice in a final ritual ' he is waiting the number to grow to one hundred. The day the number is completed, a hundred crowned heads will be ritually sacrificed by him. No rajasooya will be possible unless Jarasandha is eliminated. Eliminating him is not only a political necessity for Yudhishthira if he wanted to perform rajasooya, but is the need of the hour. Dharma calls for it. Krishna also tells him it is impossible to eliminate Jarasandha through a war. He is too powerful for it. But he has to be eliminated, there is no alternative to it. And Krishna tells Yudhishthira the time is right to do so. Krishna himself has fought seventeen battles with Jarasandha, all forced upon him by the evil emperor, but eventually had decided to move away from Mathura to Dwaraka for the safety of his people. Jarasandha has a personal grudge against Krishna. The wicked Kamsa, Krishna's uncle whom he killed, was Jarasandha's son-in-law and Jarasandha wanted vengeance for the killing. However, in the seventeenth and final battle they fought, a happy thing happened. Kansa had two ministers, Hamsa and Dimbaka, brothers who were totally devoted to each other. In the battle some other king by the name Hamsa was killed and when Dimbaka heard of this, the jumped into the Yamuna and committed suicide, thinking it was his brother who had been killed. He did not want to live without his brother. And when Hamsa heard this, he too jumped into the Yamuna and killed himself. This has weakened Jarasandha to some extent, as has the death of Kamsa. It is the right time to strike him. Both Bheema and Arjuna too are of the opinion that this is the right thing to do and that it can be done through the combined power of Bheema, Arjuna and Krishna. Yudhishthira, however, does not have the self-confidence that these three have. As he very frequently does, he begins wavering, unable to make up his mind. He is also worried for the life of his brothers and Krishna. He begins praising the virtues of contentment rather than valor. Considering everything, in spite of his great desire to do the sacrifice and become an emperor, he says it is better to forget all about it. Rajasooya appears indeed to be difficult and the best thing is to drop the whole idea, he tells Krishna. 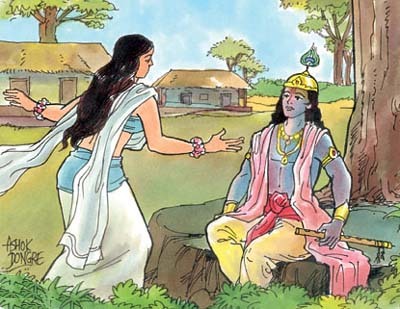 Krishna finds that Yudhishthira is still does not have the confidence required. Krishna explains his plan. Arjuna, Bheema and he would go to Jarasandha and challenge him for a one-to-one dual. And Jarasandha would choose Bheema ' for he is a great warrior and for fear of ill-fame, he would want to fight only the greatest among them. And Bheema would kill him. Perhaps Krishna still does not see the light of confidence in Yudhishthira's eyes. But slaying Jarasandha is the need of Dharma and lokasangraha. And nothing would stop him from achieving that goal. He knows there is only thing that would make Yudhishthira relent. And Krishna does exactly that. He guarantees Yudhishthira the lives of both Arjuna and Bheema [and by implication, his own too] ' for Yudhishthira is not confident of ruling his own kingdom without them, forget about performing the rajasooya, which requests the conquest of all other kings. As he says repeatedly, Bheema and Arjuna are his right and left hands. Bhimasenarjunau sighram nyasabhutau prayachha me. then make over Bheema and Arjuna to me, as a pledge, without loss of time!" Finally Krishna has succeeded in instilling confidence in Yudhishthira. The Kuru prince protests desperately. 'Achyuta, Achyuta, don't say that, don't speak so. You are our lord and master, and we are your dependents.' He then agrees to Krishna's plan and declares he regards Jarasandha already dead, the kings imprisoned by him already released and his own rajasooya, already performed. Instilling confidence in his people is one of the basic functions of any leader, whether in ancient days or in modern days, whether in a war or in a business organization. A leader who fails to instill confidence in his people fails to qualify as a leader, so fundamental is the leadership function of instilling confidence. The ability to build confidence is part of the referent power of the leader, his most important power base as far as his dealings and relationships with his follower are concerned. And this ability depends on the leader's integrity, commitment, courage and consistency. As a leader, Krishna shows the highest level of integrity, total consistency of purpose, absolute commitment to his goals and unsurpassed courage in facing the challenges these offer. Any leader if he wants to deserve the name of leader will have to show integrity, consistency, courage and commitment so that he can instill confidence in his followers. It is confidence thus instilled that gives wings to the followers and makes the impossible possible. Incidentally, J. Collins in the January 2001 issue of Harvard Business Review defines Level 5 leadership as 'the highest level in a hierarchy of executive capabilities, who blend extreme personal humility with intense professional will.' What Krishna shows is Level 5 leadership at its best.